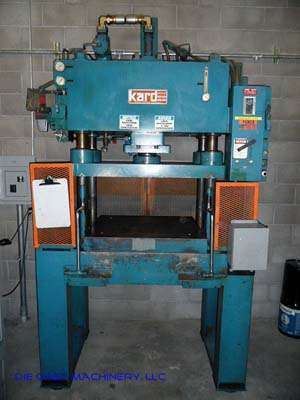 For Sale: One - Used - Second Hand - Kard 30 Ton Four Post Vertical Die Cast Trim Press. Inventory item: DCM-2770. One Used (second hand) Kard, Model TP30, Serial Number 1815, 30 ton hydraulic 4 post, vertical die cast trimming press for die castings or foundry use. DCM Inventory Number 2770.